The Chinese lunar calendar dates back to the second millennium BCE. Unlike our calendar, which numbers the years progressively from a given time (the birth of Christ), the Chinese calendar is cyclical. Each cycle is made up of 12 years; after the 12th year, the cycle is repeated. The Chinese associate each year of a 12-year cycle with an animal, and they refer to the years as "the year of the dragon," "the year of the ox," and so forth. The 12 animals and the years associated with them are often represented on a circular chart, and for this reason they are known as animals of the zodiac. The use of the animal names in the calendar led to the development of Chinese astrology. Astrology can be defined as a pseudo-science linking human destinies to charts associated with heavenly bodies or the recording of time. The Chinese believed the characteristics of a given zodiac animal influenced the personality of every person born in that year. They used this information to create horoscopes, daily predictions based upon the year of one's birth. Although the reading of horoscopes is popular in modern Chinese culture, few people take the predictions seriously. In this lesson plan, students will learn about the 12 animals of the Chinese zodiac. In the introductory first lesson, they will see how animals are often used as symbols. In the second lesson, they will hear one of several versions of how the 12 animals were chosen. They will then focus upon a few of the animals in the story and see how they can be used as symbols of certain human characteristics. In the third lesson, they will be introduced to the other animals of the zodiac, and they will be given a chart on which they will assign traits to each animal. Then they will consult a number of websites to find the traits traditionally associated with the animals, which they will add to their list. Then, they will come up with a number of ways to compare and contrast the animals in the list. In the third lesson, they will focus upon the animal associated with the year of their birth, learning about its traits and discussing whether or not these apply to themselves and their peers. Finally, each student will make an acrostic, combining the letters of his or her first name with adjectives that relate to his or her zodiac sign. What are the 12 animals of the zodiac and how were they chosen? What traits are associated with them? How are the animals used as symbols? What is your animal sign, and what traits does it represent? Gather together seven or eight pictures of animals/insects/birds from picture books or magazines. Try to include an owl, a bee, an ox, and others commonly associated with specific adjectives (i.e., wise as an owl, busy as a bee, strong as an ox, sly as a fox, slippery as an eel, etc.). Download the chart in Activity 3 and make copies for each of your students. Review the information in the introduction. Then access and become familiar with the EDSITEment-reviewed websites referred to the Lesson Activities. 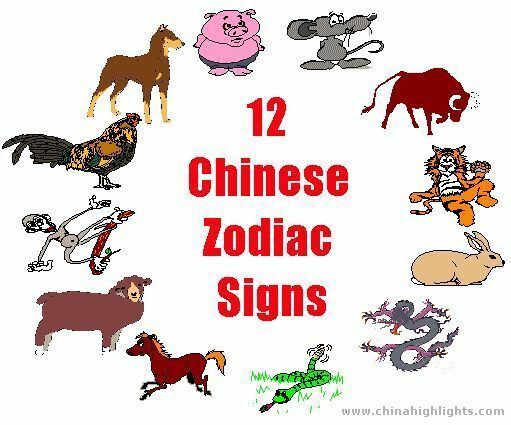 They provide additional data about the Chinese calendar, Chinese astrology, and the characteristics associated with the 12 animals of the Chinese zodiac. There is an interesting folktale about how the order of the 12 animals was determined. You may enjoy reading this Zodiac story aloud. This good source on the Chinese Zodiac and the Chinese New Year is within the China Travel Guide available from ipl2. Notice on the overview there is a chart of each animal as you look them over explain the Chinese Zodiac years of birth are also called Chinese Zodiac animal years or ben ming nian. Because the Chinese animal zodiac is a rotating cycle of 12 years, every 12 years a certain animal year recurs as the year that corresponds to the signs. As you click on the pages of specific animals, select a few short excerpts you will read aloud to your students. Focus on the images of the animals. During this lesson plan, the online materials should, if possible, be presented to the students by means of computer-projected images on a large screen. They can also be presented at individual computer stations or to small groups sharing computers. Explain to the students that they will be learning about how animals can be used as symbols. Show them the pictures of the animals, birds, and insects you have collected from books or magazines. Ask the students what characteristics come to mind when they see each animal. For example, a bear might seem very powerful, a puppy playful, a deer graceful, and so forth. Mention a few common similes, such as "busy as a bee," "wise as an owl," and "sly as a fox." Ask the students to think of other animals that seem closely connected with descriptive phrases. Write the names of the animals you have discussed so far on the board, followed by the adjectives linked with them. Tell the students that the animals are often used as symbols for particular human traits. Refer to examples you have already discussed. Tell them that a picture of a bear can simply represent power or being tough. So it is a symbol for power. A picture of an owl can represent wisdom. It is a symbol of wisdom. (Of course, in reality, birds are not particularly wise!) Now go back to the original animal pictures. As you hold up each one, call upon individual students to name a trait often associated with it. Tell the students that animals are used as symbols in the Chinese calendar. Explain how the calendar is divided into 12-year cycles, each year being associated with a certain animals. Ask if they have any ideas of what the animals might be. Remind them that the Chinese would choose animals that lived in their country and with which they were familiar. This would eliminate such creatures as giraffes and hippopotami. After the students have made a few guesses, tell them that the first two in the list are the rat and the ox and that they are about to learn why this is so. Then navigate to the EDSITEment-reviewed website The Chinese Zodiac and read aloud the story of how the 12 zodiac animals were chosen. Explain that this is one of many versions of this particular tale of origins. Remind the students of the warm-up, mentioning that animals are often used as symbols. Write the names of rat, cat, and ox on the chalkboard (or whiteboard). Then, referring to the story, ask what words (adjectives) could be used to describe each of these three animals. Write them down after the names of the animals. Have the students explain why they chose the words they did. For example, the rat is clever because it figured out how to trick the cat and the ox. Ask what each animal symbolizes. After the answers are given, tell the students that in the next Activity they will learn about the other 10 animals of the Chinese zodiac. Activity 3. What do the Zodiac Animals Symbolize? Hand out the copies of the pictures of the zodiac animals from the interactive diagram from the Art Institute of Chicago. Use the animal names below each picture in the diagram to identify the zodiac creatures in the picture. Explain that, like the cat, rat, and ox, each of these animals is a symbol. Brainstorm with the students until they can come up with several adjectives to describe each of the 12 animals in the picture. Now hand out copies of the chart (provided in .pdf format). Write the three categories on the board as well. Have the students write down one positive and negative trait for each animal listed on their charts. Do the same on your chart on the board. Now look up the traditional descriptions of the zodiac animals. Begin at the Chinese Zodiac available through EDSITEment-reviewed Asia Source. Click on "Haskell by the Month," then on "February," then on "Chinese New Year." Call upon different students to read aloud the description of each animal. Discuss these descriptions. Note the comical images of the animals. Now go to "Chinese Astrology: An Ancient viewpoint on temperament and personality". Click "What is Chinese Astrology?" Then click "Zodiac Sign Beanie Babies." Discuss the descriptions of the animals with the students. Ask them if they think the traits assigned to them seem appropriate or not. Click on each picture as you progress to make the figure larger. Now go to Go to the "Chinese Astrology" page at. Click on the specific animals. Read aloud the excerpts you have previously selected. Have the students look closely at the photographs of the animals. Point out that the 12 animals are portrayed somewhat differently at each of the three websites visited so far during this activity. (They're comical in the first, soft and cuddly in the second, and realistic in the third.) Ask the students which type of pictures they prefer and why. Draw their attention to the Chinese character, which represents the name of the animal at the end of each description. Explain that Chinese writing is very different than our own. Now go to Zodiac Fortunes and have different students read aloud this final group of descriptions. Comment upon the similarities of the various descriptions that have been read as well as the differences. Then return to the chart you started at the beginning of the Activity. Have the students suggest which traits (positive and negative) should be added. When this task is done, call upon different students to read aloud the information about each zodiac animal as it has been defined by the class. Now have the students compare and contrast the characteristics of the animals on the list. For example, ask them which animals seem the most athletic, which seem more thoughtful or imaginative. Ask them if all the animals are real. (Only the dragon is not.) Try arranging the animals in groups according to whether they are farm animals, wild animals, or animals you might have at home. Some, such as the rat and rabbit, would fit into more than one category. Ask if there are other ways the animals can be compared. When you finish this activity, tell the students to keep their charts in a safe place for the next activity. Activity 4. What Sign Are You? Review the chart made in Activity 3. Then tell the students that they will learn more about the animal linked with the year of their birth. There will most likely be two animals represented in the class, given the span of birth dates. Consult the Chinese horoscope chart downloaded from "Twilight Zone's Chinese Horoscope" to determine which animals apply. Click on those animals. Call on students (born in the appropriate year) to read the descriptions aloud. Discuss how these traits do or don't apply to members of the class. Ask for examples, i.e., someone might described as creative, someone else as talkative. Remind the students that all people have many facets to their personalities. Remind the students that astrology is not a science but rather an amusing pastime, and that the interest in the animals of the zodiac adds another dimension to Chinese culture. Return to the sites visited in Activity 3 and read again about the animal(s) associated with your class. Continue the discussion of how these traits do or don't seem appropriate. Now that the students are well versed in the traits associated with their zodiac animal, have them make acrostics on large sheets of paper. Ask them to write the letters of their first names with bright markers in a column from the top to the bottom of a sheet of paper. Then have them write several adjectives or descriptive phrases after each letter. The adjective or the first word of the phrase must start with that letter. Examples of possible descriptions include the following: Loves to draw, Never gives up, A good friend, Extremely strong, etc. Students might also include a small drawing of their zodiac animal in one corner of the paper. When the acrostics are completed, you can display them on a bulletin board. 1. Assign the 12 animals to one or two students, depending on class size. Using the information gathered for the chart, have them make a large poster, with a drawing of the animal, recent years associated with it, and adjectives that describe it. Courtyard mosaics from the Chinese Cultural Centre, Chinatown, Vancouver. Assign an animal to each student. Have the student cut out the picture of that animal and paste it on the top of a strip of oak tag. Below the picture he should write three or four adjectives describing that zodiac animal. The bookmark can be laminated to make it more durable.